Post Office is an exercise in imagining counter-institutions in response to the crisis of those very institutions. It's an endeavour in devising practices that collectively re-configure the public infrastructures against the onslaught of managerial neoliberalism and technological acceleration. As a research collective (connected to the Centre for Postdigital Cultures at Coventry University), it is a horizontal experiment in knowledge production and action situated between theory and technology, politics and poetics, the inside and the outside of the university. Here you can find out about us, our conceptual framework, commitments, events and news, projects, technosocial workflows we develop and our Post Office Press. This is the first in a series of symposia hosted by the Centre for Postdigital Cultures (CPC) exploring contemporary approaches to experimental publishing. 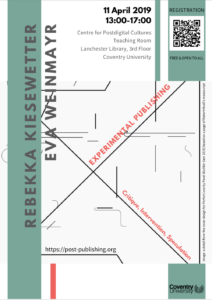 Over the course of the series, we will ask questions about the role and nature of experimentation in publishing, about ways in which experimental publishing has been formulated and performed in the past, and ways in which it shapes our publishing imaginaries at present [more].